What is a Crappie Rod and What is it Used For? Are All Crappie Rods the Same? What Makes a Good Crappie Rod? Crappie are, unlike their name might suggest, a very popular species of fish anglers seek out. A part of the sunfish family, these small fish reside in freshwater all across the United States. They are widely considered to be one of the best tasting freshwater fish, which make them an attractive catch for many anglers. To maximize your chances of catching crappie, it’s important to have the correct rod for the job. There are many different brands and styles that will work well, but to get you started, this article will answer some important questions and lay out five of our favorite crappie rods. A crappie rod is a fishing rod that is used specifically, if not exclusively, for catching crappie and similar species. Crappies are a smaller fish species and can weigh up to three to four pounds, but typically weigh closer to ¼-½ of a pound. Because of this, crappie-specific rods tend to be more lightweight than a general-use rod. These rods need to be lighter so they are sensitive to bites and tugs from a light fish. Typically, lightweight rods tend to be made out of graphite or some sort of graphite composite. Although graphite is not as strong as fiberglass, it works well for crappie fishing because it is very sensitive to bites. In addition, the odds of pulling in a giant crappie that would damage your rod are slim, so there is little to worry about in terms of strength. Although most crappie rods are similar, they’re not one and the same. There are a couple different types of rods that are common. A spinning rod and reel is one that is great for catching crappie during their spawning season in the winter. It should be light or ultralight, so you can cast your lure a great distance. 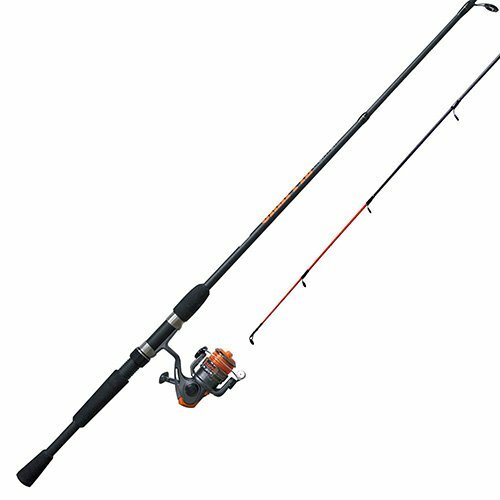 Another common tool is a baitcasting rod and reel, which are better suited for catching crappie while trolling or drifting. These rods make it easier to drop your line straight down from your watercraft. Believe it or not, cane poles are also a semi-popular choice for crappie fishing. Their length tends to be very helpful when you’re in the scenery with a lot of obstacles that keep you directly from the shore. Length - There’s not one length for an ideal crappie rod, but in general, they should be long enough that you can cast far, but not so long that casting and transportation become awkward and difficult. Crappie rods generally range anywhere from 6-10 feet. Power - Because crappie is a small species of fish, your rod doesn’t need a ton of power. Stick to somewhere in the ultralight to a medium/light range to keep your rod sensitive to small fish. Material - Graphite or a graphite composite is the best route to go for crappie fishing. Graphite is a lightweight, super-sensitive material, which makes it great for picking up small nudges and bites from small fish. There are a variety of styles of crappie rods that will do the trick. All of them vary in length, power, and action, and serve different purposes in the sport of crappie fishing. Here is a list of some of our favorites. ​Lew’s is a popular brand for crappie rods. The Wally Marshall Pro series put together a foolproof combination of elements to create a great rod. The blank is constructed with “premium IM8 graphite,” and its the reel seats feature graphite construction as well. The material increases sensitivity to small bites. The spinning guides are made with stainless steel and stainless steel inserts. A cork handle with extra length provides more control when casting and reeling in a catch. 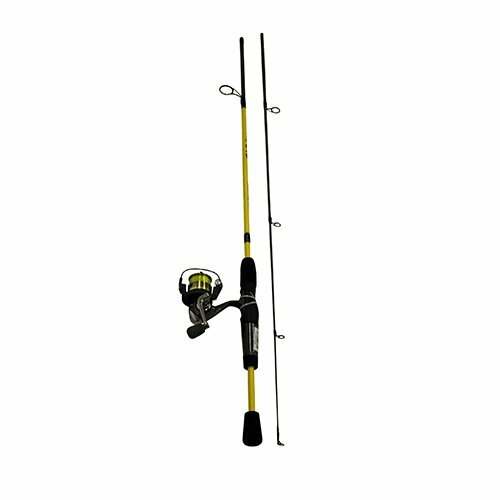 This particular two-piece, 10-foot rod features medium/light power and medium action. In addition, the rod comes with a stainless steel hook keeper. The Wally Marshall Pro rod is a sensitive, lightweight rod that will be able to detect very small bites. Reel seats are not typically made out of graphite as well, so Lew’s rod gets bonus points for this added sensitivity. Although its length offers ease in casting, it can be a little awkward because of the amount of space the rod takes up, so ensure you have an ample amount of space in your desired fishing spot before taking this rod on the road. 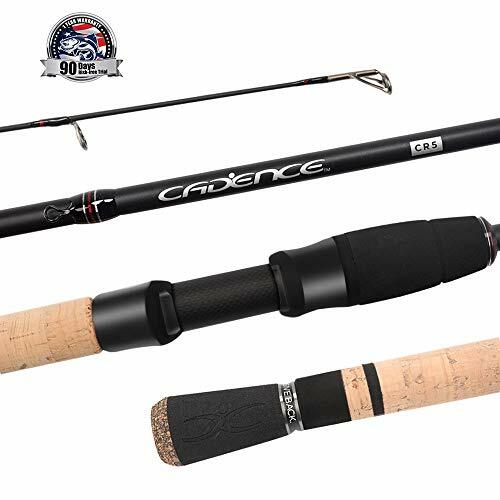 ​The Cadence CR5 spinning rods come in a variety of sizes and actions depending on your own fishing needs. Their lengths range from the super small 4’8” with ultralight power and moderate action, all the way to a seven-foot pole with medium-heavy power and fast action. Their rod blanks are constructed with 30-ton graphite, which offers sensitivity while keeping the rod strong in the face of larger fish. The handles are a combination of cork and EVA foam. It also features stainless steel guides with SIC inserts for smooth casting and added durability. With varying lengths, actions, and powers, the CR5 series is a much more versatile set of rods. Although it’s a little stiff, it’s totally usable for fishing for crappie, as well as a variety of fish. The quality of this rod is incredible for its price point, and the graphite construction offers a great deal of sensitivity. Some users did complain about the style of the handle, but there are personal alterations you can make to make it more comfortable. This a crappie-specific spinning rod from B’n’M Duck. It’s created with features that make it great for catching small fish. The lightweight, four-foot rod is created with a “40 million modulus IM6 graphite” blank for sensitivity. It also features Duck Commander’s unique double touch system, with a genuine Portuguese cork handle. As with the previous rods, this rod also has stainless steel guides for durability and smooth casting. 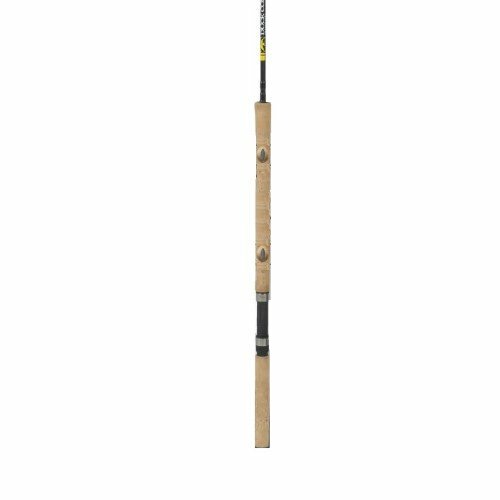 If you’re looking for a rod exclusively for crappie and crappie only, this is a great pick. It’s a great value for the quality and its construction makes it super sensitive and easy to use. The downside of this rod is that it doesn’t come with a great deal of versatility. It’s a small, light rod, which means if you’re trying to catch bigger fish species with it, there’s a chance it might not be as durable. 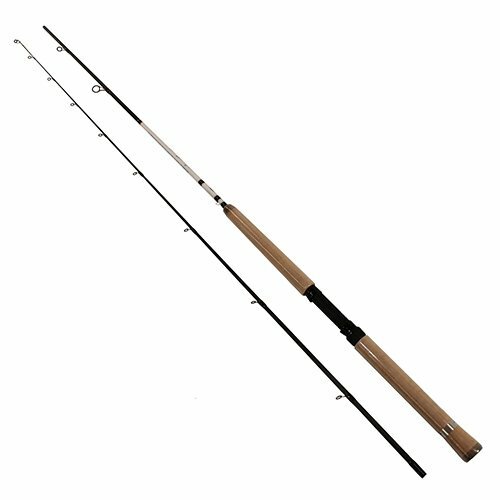 ​This is a 5’6” rod made specifically to fish for crappie. It features several aspects that make it great for fishing for small fish, like its size. It’s lightweight, constructed with fiberglass and graphite. The light action blank is made with graphite with dual-body construction, and the reel seat is also created with graphite for added sensitivity. There are stainless steel guides and inserts, as well as a lengthy EVA foam handle with a split grip. The reel comes pre-spooled with Mr. Crappie line, and the rod features a chrome-plated spool and a drag knob. Mr. Crappie’s Slab Shakr is a good beginner’s choice. It comes with all the features necessary to pull in crappie, with no added frills. The graphite construction is the best aspect of this pole, keeping it sensitive to small fish. The length and weight of this pole make it perfect for casting lures far distances without strain, although this pole isn’t long or strong enough for fishing for larger species. Bring along a backup pole if you’re planning on pulling in any trophy fish. ​Zebco’s Crappie Fighter series offers a variety of sizes, actions, and powers when it comes to their crappie rods. They range from six-foot with light power all the way to 12-foot with light power. There are also ultra light options as well. The handle designs and sizes also change with the pole lengths, giving you lots of options depending on your preferences. All of their crappie rods are constructed with fiberglass composite, which provides durability as well as sensitivity. The line comes pre-spooled, and every rod comes with a ten-inch ruler printed on the side to ensure that your catch falls under the legal requirements in your state. ​Designed with crappie fishing techniques in mind, the crappie Fighter series will get the job done, no matter what size you choose. This is a great line as it offers so much versatility in terms of sizing and power variations, allowing the user to pick and choose depending on their own fishing needs. Consider using your own line with this rod, as many users complained the pre-spooled line tangles easily. Using a crappie rod will differ depending on the length of your pick. When using a long rod, it’s easiest to find a spot where crappies will likely be, and then drop your line directly into that spot. Long rods give you more precision and accuracy. Crappie often like to hang around docks or piers, so if you have a shorter rod, casting to an area that is wooded with dock poles will usually yield results. Jigging is a popular crappie fishing technique; this is a great alternative to casting when you don’t have the space. The video below covers where crappie are most likely to be found during their winter spawning months, as they tend to enjoy warmer water. The video also demonstrates the use of a longer cane rod, which is ideal for dropping bait straight down into the water as opposed to casting. Taking care of your crappie rod is vital to ensuring the durability and longevity of the rod. First, use a sponge to dab the rod with warm, soapy water. Rinse with hot water and leave to dry. Avoid leaning your rod against a hard surface for extended periods of time; it can result in bends in the pole. Always use a rack so the rod is fully suspended. For a thorough, quick cleaning, the video below covers an alternative way, using a combination of cleaning wipes and q-tips. Generally, keep your rod safe by always having it in eyesight. Never let the rod strike against a hard surface as it can result in damage. Keep it off the ground when you’re outdoors to avoid the possibility of others stepping on it. Carry your rod horizontally with the tip facing backward to prevent accidentally breaking or smashing the tip into the ground. Fishing for crappie is a rewarding experience that often results in a delicious meal, as crappie are well known as one of the best tasting freshwater fish. If you’re thinking about fishing for crappie for the first time, hopefully, this article gave you some helpful hints and tricks in picking a rod that will yield success.